Often life-threatening, infections of the central nervous system are infectious disease emergencies. They require immediate treatment. Central nervous system infections are fortunately rare, but they are extremely serious. The cerebral cortex and spinal cord are confined within the restricted boundaries of the skull and boney spinal canal. Inflammation and edema therefore have devastating consequences, often leading to tissue infarction that in turn results in permanent neurologic sequelae or death. To understand the pathogenesis and clinical consequences of Central nervous system infections, a working knowledge of basic neuroanatomy and neurophysiology is important. The cerebral cortex and spinal cord are suspended in and bathed by cerebrospinal fluid, which is produced by the choroid plexus lining the walls of the cerebral ventricles and resorbed by. The arachnoid villi drain into a large midline vein, the superior sagittal sinus. The cortex and spinal cord are surrounded by three tissue layers called the meninges. The two layers closest to the cortex are called the pia mater (directly overlying the cerebral cortex) and the arachnoid. These layers make up the leptomeninges. The third layer, the dura mater (pachymeninges), serves as the outer layer. The cerebrospinal fluid flows between the pia mater and arachnoid in the subarachnoid space. 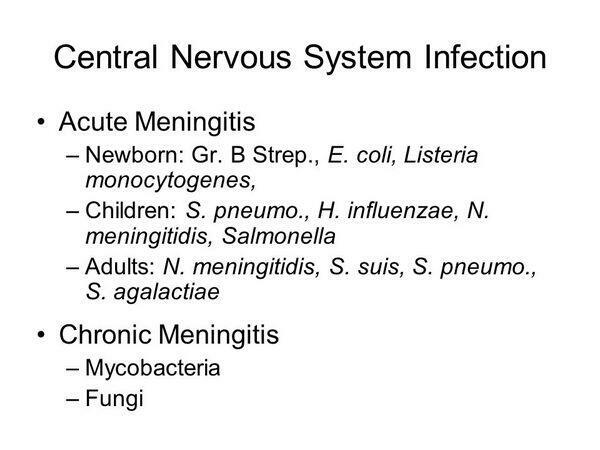 Central nervous system infections are classified by the site of the infection. Infection of the cerebral cortex is called encephalitis, and infection of the meninges is called meningitis. Abscesses usually form in three locations within the central nervous system: the cerebral cortex, where they are termed brain abscesses; between the dura and arachnoid, where they are called subdural abscesses; or immediately outside the dura, where they form epidural abscesses. The capillaries of the brain and spinal cord differ from those in other regions of the body. The tight junctions linking the endothelial cells of the vessels in this region are less permeable than they are in vessels elsewhere. The limited permeability of the Central nervous system vessels forms a physiologic barrier that is commonly called the blood-brain barrier. This barrier protects the Central nervous system from invading pathogens and toxic substances. However, the impermeability of the Central nervous system capillaries not only confers a protective effect, it also prevents the entry of immunoglobulins, complement, and antibiotics. Therefore, if a pathogen breaches the blood-brain barrier, the host's initial defense mechanisms are impaired, which partly explains the rapid progression and serious consequences of Central nervous system infections. Antibiotics used to treat central nervous system infections must be capable of penetrating the blood-brain barrier, and because penetration of all antibiotics is impeded, maximal doses (sometimes termed "meningeal doses") are required to cure Central nervous system infections. Often subacute in onset. Development of motor weakness indicates imminent spinal cord infarction and requires emergency surgical drainage. After the dura passes below the foramen magnum, it no longer adheres tightly to the bone surrounding the spinal cord. Both an anterior and a posterior space that contain fat and blood vessels are present. Infection can spread to the epidural space from vertebral osteomyelitis or disk-space infection. Infection of the epidural space following epidural catheter placement is increasingly common, as is postoperative infection following other surgical procedures in the area of the spinal cord. Skin and soft-tissue infections, urinary tract infections, and intravenous drug abuse can all lead to bacteremia and seeding of the epidural space. In approximately one third of patients, no primary cause is identified. The inflammatory mass associated with infection can compress the nerve roots as they exit the spinal canal, causing radicular pain, and findings consistent with lower motor neuron dysfunction (decreased reflexes, loss of light touch and pain sensation in specific dermatomes). In addition to radicular pain, patients complain of localized back pain. These symptoms often are accompanied by malaise and fever. As the epidural mass expands, the spinal cord is compressed, resulting in upper motor neuron findings such as a positive Babinski's reflex, hyperreflexia, loss of motor function, and bladder dysfunction. Usually within 24 hours of the onset of paralysis, the spinal cord's vascular supply becomes irreversibly compromised, leading to infarction and permanent paraplegia. To prevent this devastating outcome, clinicians need to consider spinal epidural abscess in the differential diagnosis for back pain. In the patient with back pain and fever, spinal epidural abscess must be strongly considered. A helpful clue can be derived from the physical examination. In posterior epidural abscesses, severe localized tenderness over the infected area is encountered. However, in anterior epidural abscesses (a rarer event) infection is deep-seated, and tenderness cannot be elicited. Epidural abscess formation can be readily visualized on magnetic resonance imaging scan , which is the preferred test. A computed tomography scan with gadolinium contrast is also an effective method of diagnosis, but is now seldom used. The bacteriology of epidural abscess reflects the primary site of infection. S. aureus, including the methiciUin-resistant form (methicillin-resistant Staphylococcus aureus), is cultured from more than half of cases. Gram-negative aerobes are the second most frequent cause, followed by aerobic streptococci, S. epider-midis, and anaerobes. Mycobacterium tuberculosis is another important cause, most commonly associated with tuberculous infection of the thoracic vertebra. Because of the unpredictability of neurologic complications, surgical decompression is recommended in all cases in which magnetic resonance imaging scan suggests any neurologic compromise or evidence of significant cord compression. Drainage is combined with prolonged antibiotic treatment (4 to 6 weeks). High doses of nafcillin or oxacillin (or vancomycin if methicillin-resistant Staphylococcus aureus is suspected), ceftriaxone, and metronidazole are recommended as empiric therapy pending culture results. The spinal canal has both an anterior and a posterior epidural space containing fat and small vessels. The spinal epidural space can become infected byspread of infection from osteomyelitis or disk space infection. spinal surgery or epidural catheter placement. hematogenous spread from skin or urinary tract infection or intravenous drug abuse. low back pain and fever. radicular pain accompanied by lower motor neuron deficits. signs of cord compression in later stages (Babinski's reflex, hyperreflexia, loss of motor function, bladder dysfunction). Within 24 hours of onset, irreversible paraplegia may occur. localized spinous process tenderness in posterior epidural abscesses. In the patient with back pain and fever, always consider spinal epidural abscess. Magnetic resonance imaging scan with contrast is the diagnostic study of choice. emergency surgical drainage if physical exam suggests neurologic compromise or magnetic resonance imaging shows significant cord compression. Prolonged antibiotic therapy (4 to 6 weeks) with nafcillin or oxacillin, metronidazole, and ceftriaxone. If methicillin-resistant Staphylococcus aureus is suspected, van-comycin coverage is also required.